An A to Z, with clues to the game from Briar and (mainly) bookish thoughts from Jane …. Jane wanted to write about this and that, Briar wanted to give a couple of hints to help with the last round of her game, and so an A to Z felt like the right thing to do …..
A is for ANGELA CARTER WEEK. It’s so very nearly here, and I have plucked my copy of ‘The Magic Toyshop’ – the first Angela Carter book the I wrote (I think it was my first Virago Modern Classic too) from the shelf to re-read. D is for DEMON. It’s not one of the Thirkells reissued by Virago – yet – but the library has a copy on The Demon in the House and so I placed an order. E is for ELIZABETH HAWKSLEY. I don’t know a great deal but I spotted a historical novel set in Cornwall and another called ‘Frost Fair.’ The library won’t send out the first book – it’s in the Cornish reserve – but they will send out the second one and so I’ve placed my order. 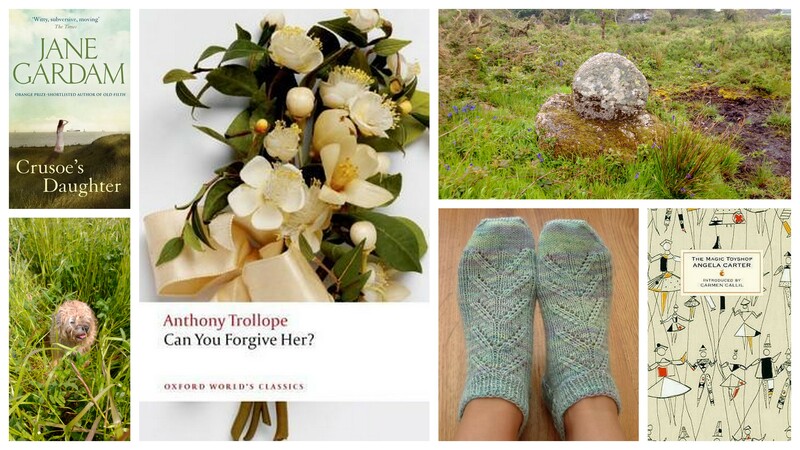 F is for ***CLUE NUMBER 2*** You have the intital letter now, and you could find the answer in the blog list at Persephone books too …. G is for GREATEST HITS. As we maybe made Briar’s game a little tricky this time we decided that next time will will make it easier with a bumper greatest hits version – lovely bloggers who have been featured before but this time with different books. H is for HOCKING. A name from West Cornwall, and an author published by Virago, being celebrated by Heavenali this month. I is for INDIAN QUEENS by Nick Lowe. It was very strange when I heard a song about an unusually named Cornish town on the radio at work in London, many years ago now, and its stranger now that the song comes back into my head still whenever I hear the name of the town …. J is for JANE GARDAM. Claire’s enthusiasm is infectious, and now I have a copy of ‘Crusoe’s Daughter’ on my library pile. K is for KNITTING. I’m borrowing an idea from the Life During Wartime Challenge – footlets! L is for LOVRIC. I had intended to write about ‘The True and Splendid History of the Harristown Sisters’ by Michelle Lovric tonight, but it was so wonderful that I am still lost for words. M is for MARY STEWART WEEK. It was lovely last year and Anbolyn is hosting it again this year, between 14th and 21st September. N is for NO NAME by Wilkie Collins. I just picked it up to check the date for my 100 Years of Books, I didn’t mean to start reading, but I had to. O is for OPEN LIBRARY. I have ‘Mrs Westerby Changes Course’ on loan at the moment, and it’s ver good but not at all what I was expecting. P is for PARIS IN JULY. It’s coming soon and I have the classics in mind. Balzac, I think, and maybe a little more Dumas. R is for RHODA BROUGHTON. I have ‘Cometh Up as a Flower’ lined up for my 100 Years of Books. S is for SIXES. We’re nearly hallway through the year and then it will be time to play again. T is for TOLSTOY. I’m still wondering how to write about Anna Karenina. U is for UNDER THE DINING TABLE. We have a new vacuum cleaner, and the moment it came out of the box Briar ran to hide in her place of safety, under the dining table. V is for VALENTINE by George Sand – ready and waiting on my bedside table. W is for ***CLUE NUMBER 3 *** You have the intital letter now, and the books with a french connection are significant …. X is for EXPOSED. We haven’t been to Madron Carn for a while, because a couple of years all of the non-native plants – mainly gorse and rhodedendron – where cut right back, and it became a barren wasteland. We went back recently, and things are beginning to grow back and it looks much better, And we found a small granite monument, simplt built but with a cross etched on the top stone. We’d never seen it before, my mother – who has loved the place ever since she went there with here two best friends when she was very young – was sure she hadn’t seen it. So it must have been exposed when the land was scalped. Y is for YOU MIGHT HAVE BEEN LOST because my computer crashed, I had to completelly reset it, and I lost a lot of lists and documents in the process. So if you haven’t heard for me, of if you think I’ve missed something, so let me know, because that might be why. Z is for ZZZZZZZZZZ – border terriers are very good sleepers. Plenty to keep you busy Jane. Hope you are well and that Briar is behaving. Ah – I think the clues may have helped – thanks Briar! I love all your “A to Z”s <3. Bookaday is being lots of fun, and I'm dying to read "No Name" by Wilkie Collins. I love these “A to Z” posts! And I’m delighted that you’ve picked up a Gardam. I haven’t read that one so I hope it’s good.